You can almost guess some of the trends dating back to early 2011. Smaller sized homes probably top the list for newly designed habitats. The McMansions have given way to much smaller environmental footprints with an eye to more efficient use of space. Also, the box design has re-emerged and architects are busy trying to give an old shape new life. Open floor plans are favored over lots of small rooms. The single most desired feature is incorporating more natural light into living spaces. To obtain more light naturally means only one thing-large windows. Here is a product that is somewhat baffling. While new home builders are shying away from solar panels and tankless water heaters due to price concerns, glass manufacturers have managed to hold on to a slight edge in consumer interest despite these other down turns. 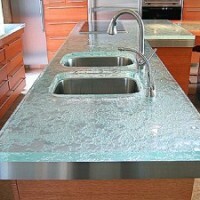 Even those who sell glass for residential use admit that their product is not cheap, but this hasn’t deterred consumers. Anderson Window Glass is now producing a pane that has an aluminum dioxide coating that sheds dirt and eliminates water spots. When you have glass walls that may reach two stories, these innovations are very important. It’s a problem to look out on a beautiful vista and see only the residue of last night’s rain. Privacy and security remain of concern when your house walls are made of glass. Hunter Douglas now has glass which is outfitted with solar energy sensors that can automatically raise and lower blinds in response to the amount of sunlight being detected. Many homeowners in this situation use landscaping to provide privacy as well. Lutron Electronics has taken this concept a step in another direction with an Iphone app that can remotely control the movement of window shades. Where glass was once an architectural “no-no” due to its low energy efficiency and attendant difficulty of causing interior damage from sunlight, it has moved into the ranks of being a staple of modern green building. Commercial builders have obviously embraced glass with steel construction for many years now and they are seeing the financial upside of the latest glass products. For many companies, this wasn’t as much of a green decision as it was an economic one. When we think of building our dream home, it is worth remembering that economics, evolving attitudes and generational differences play an important role in how those dreams manifest themselves. Smaller homes with big glass walls seems to be of architectural interest to many people. As glass continues to improve as an innovative and energy-wise product, it is likely that more and more of us will be able to let the sunshine into our lives. How does it cost and could you please let me know the difference between window tint and window film?Actually I need to do but which one is better? Window Tinting or window filming? Also I have get an address of a company named sunglowf.com they are situated in West Alaska which is the nearest to my address, can anyone provide me any feedback about this company?